Brothers Robert Doughton and Rufus Doughton exercised considerable political power and influence, Robert in the halls of Congress and Rufus in the state legislature and as lieutenant governor. 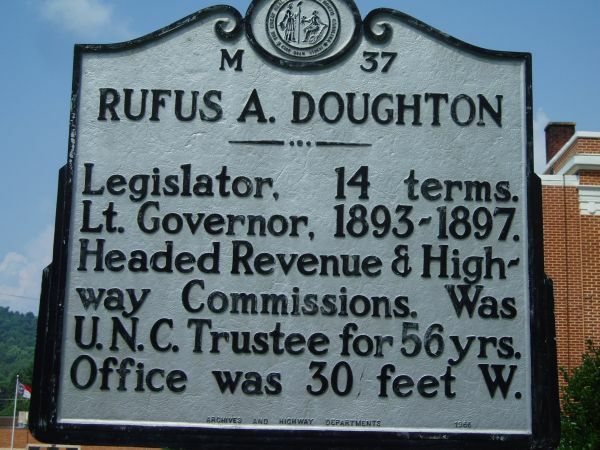 Rufus Doughton was born in Laurel Springs on January 10, 1857, and studied locally and at the University of North Carolina. He then settled in Sparta to practice law. His first election to the legislature was in 1887 and he was returned to office thirteen more times. From 1893 to 1897 he served at lieutenant governor. From that post he was the Democratic nominee in 1897 to a seat in the U.S. Senate but failed in that attempt. Doughton, like his brother, looked out for the interests of western North Carolina. He co-sponsored landmark legislation in 1921 to commit the state to a massive bond issue to back highway construction. Two years later he left the legislative to serve as Commissioner of Revenue. Governor Cameron Morrison appointed him to the revamped Highway Commission and in 1929 Governor O. Max Gardner named him chairman of that body. He retired from politics in 1933 and died in 1945.